Khao Mun Gai was my go-to dish when ordering food for friends traveling with me in Thailand, or my younger siblings when they were very small. 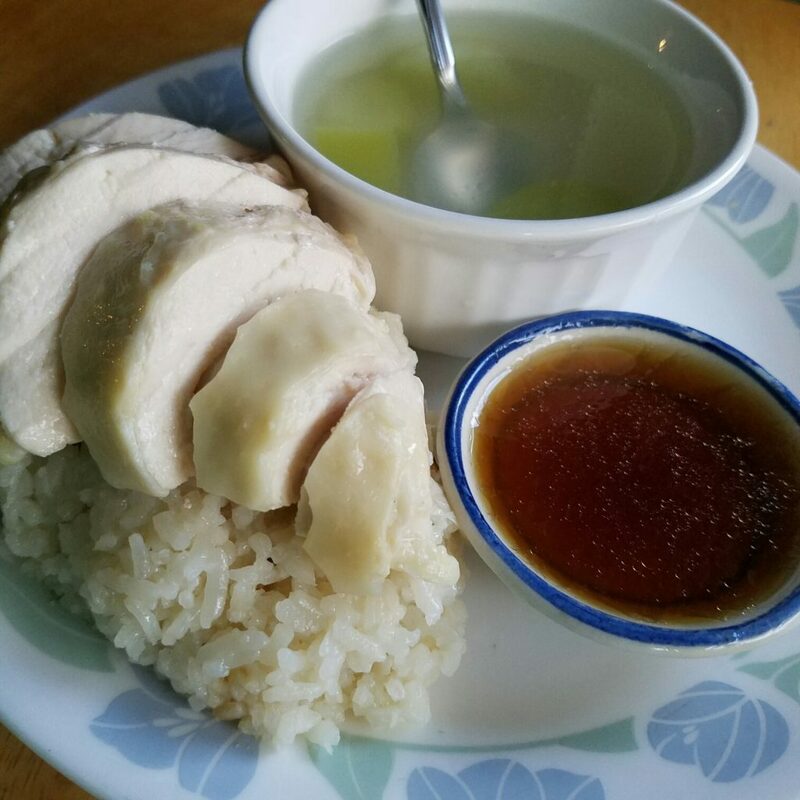 It’s tender chicken served over fragrant jasmine rice richly cooked in chicken broth and served with a pop of flavor in the form of a soy-based sauce. Often this dish was served with cool cucumbers. Easy on the travel-weary stomach and very comforting, the subtle flavors of this dish always hit the spot. Growing up, my parents used to steam the chicken and use the resulting chicken drippings to cook the rice. 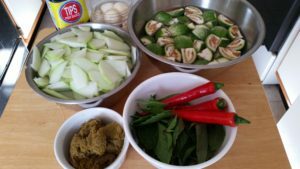 I’ve taken this dish and added quite a few cooking twists of my own so this may have evolved a bit from the traditional street food you might find in Thailand today. Recommendation: I make a lot of the components to this dish in parallel. Read through the entire set of instructions before trying to make this or you might find yourself in the kitchen far longer than necessary. Place 2 cups chicken broth (or boullion with 2 cps water) in a large soup pot and bring to a simmer. Add an additional 4 cups water and bring to a boil. 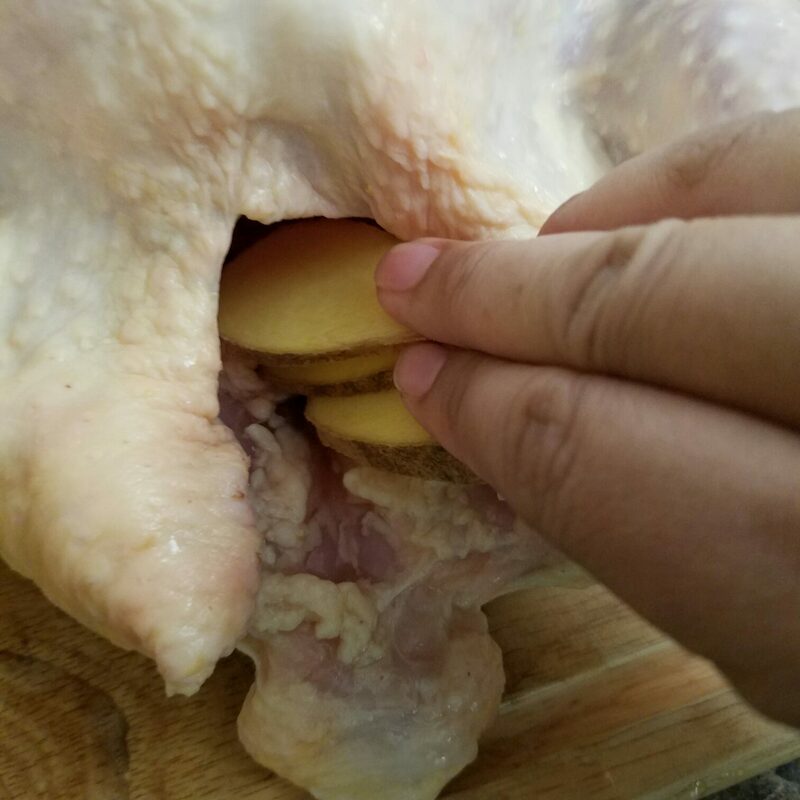 Remove the giblets, wash them, and add them to the soup pot to enhance the stock. 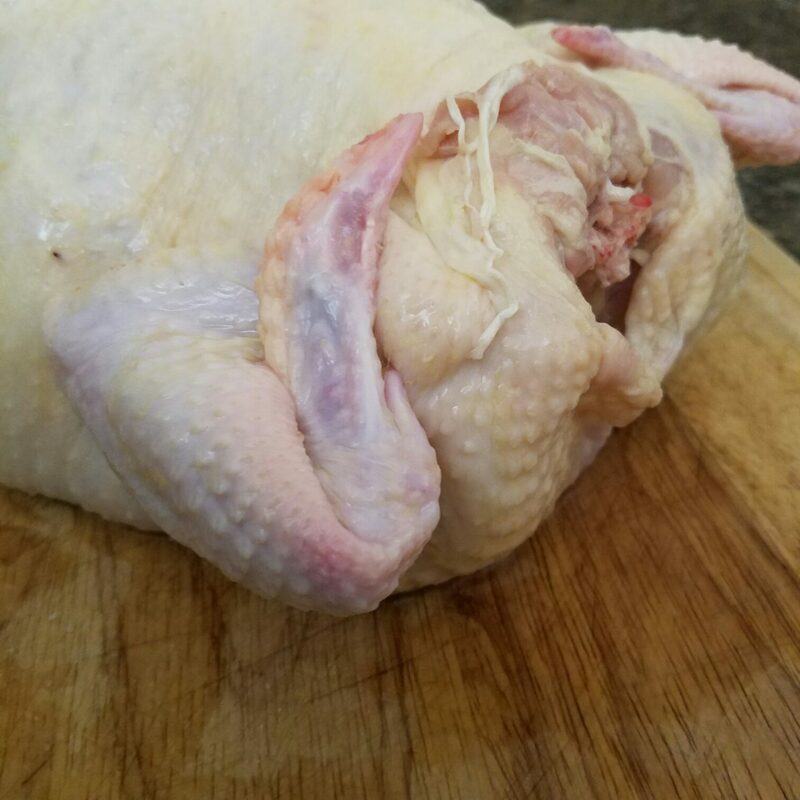 Rinse the whole chicken inside and out in cool water. 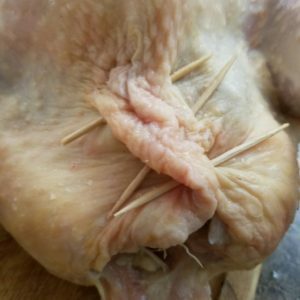 Trim off excess fat from the chicken neck and lower cavity, setting the skin aside for later use. Sprinkle salt (I use sea salt) both in the cavity of the chicken and over the outside, gently patting into the skin. Stuff ginger slices and spring onions into the cavity and close with toothpicks. Twist the wings back to ensure they don’t flop around or overcook. Once the stock is boiling, dip the chicken into the broth gently and ladle stock over the sides of the chicken until the skin tightens. Then gently lower the chicken into the soup pot until completely covered. Bring to a boil and boil uncovered for 10 minutes. Remove from heat, cover, and let sit for 45 minutes to finish cooking. While chicken is finishing cooking, place reserved chicken skin in a wok or large skillet over medium high heat. Cook until oil forms from the chicken fat and skin, approximately 2 Tbsp. Note: Using chicken fat oil here is a major aspect of the flavor in the rice but you can substitute vegetable oil if desired. 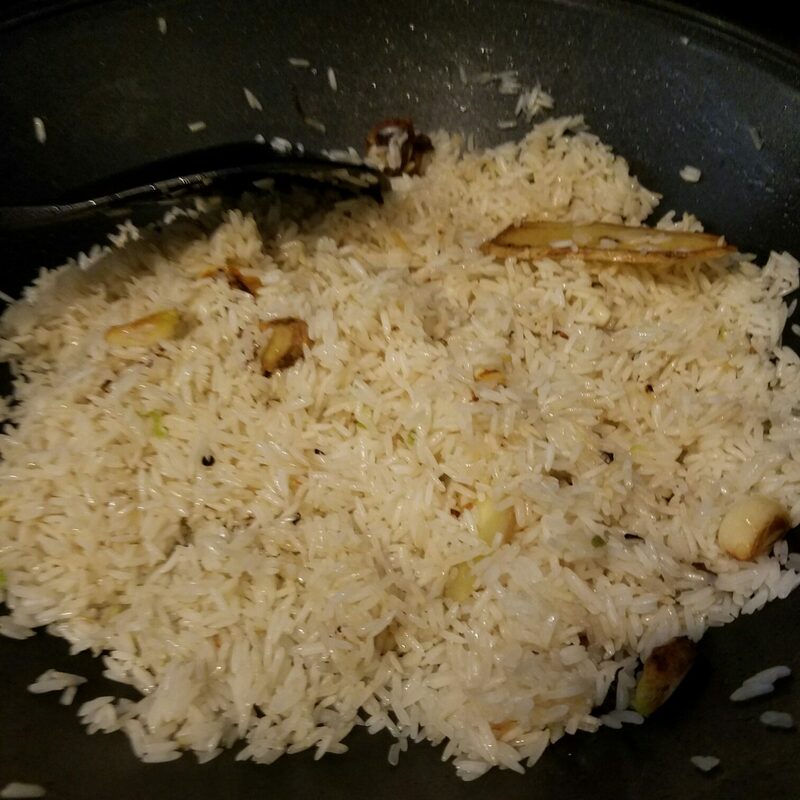 Once the oil is hot, add ginger slices and garlic, sauté lightly until fragrant to infuse the oil with flavor, then quickly add the uncooked rice before the aromatics burn. Stir fry the uncooked rice until fragrant, about 2 to 3 minutes, then transfer the contents of the wok to a rice cooker. Add the 3 3/4 cups stock from the cooking chicken. Start the rice cooker. Note: Cooking rice is a bit of a science. Older rice could take more liquid. Newer rice could require less. Pre-soaking rice before cooking will help the rice cook faster but requires less liquid when actually cooking. In general, the ratio would be for every standard cup of rice, use 1 3/4 cups of liquid. Once rice cooker signals the rice is done, open and fluff the rice. Remove the slices of ginger and discard. 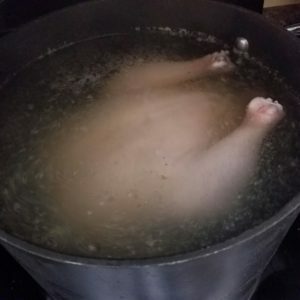 Carefully take chicken out of soup pot and place in an ice water bath to cool (or place on a plate to cool). In a small bowl, combine ¼ cup stock from cooking chicken, ¼ cup light soy sauce, 1 tbsp sugar and 1 tbsp sesame oil. Set aside to serve with main dish. A little of this goes a long way. Bring broth in soup pot to a boil, skimming off any scum and some excess oil. Add winter melon and boil for 10 to 15 minutes or until winter melon is cooked and tender. Season soup to taste with fish sauce, a sprinkle of sugar, and pepper. Soup should be mild, subtle and a gentle accompaniment to the chicken and rice. Plate the rice first, then arrange slices of the chicken on top or next to the rice. Have a small dish of the sauce next to the plate to be used as desired. Serve a bowl of the light chicken soup on the side. I was inspired to try making Chicken and Winter Melon Curry (Gang Keow Wan Gai or แกงเขียวหวานไก่) after watching Full House (Thai Version). 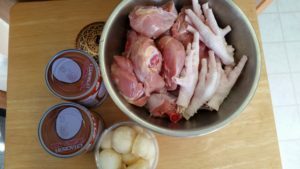 It’s with both chicken meat and chicken …feet! This is not a common dish in the US and I don’t have many US friends who eat chicken feet, actually. Most often, I’ve seen chicken feet served braised at Chinese dim sum. They can be very tasty but are considered a lot of work and messy to eat because there’s so many bones. Personally, I figure it’s not that much messier or work intensive than eating buffalo chicken wings, so if you like chicken feet, this might be a fun dish for you. 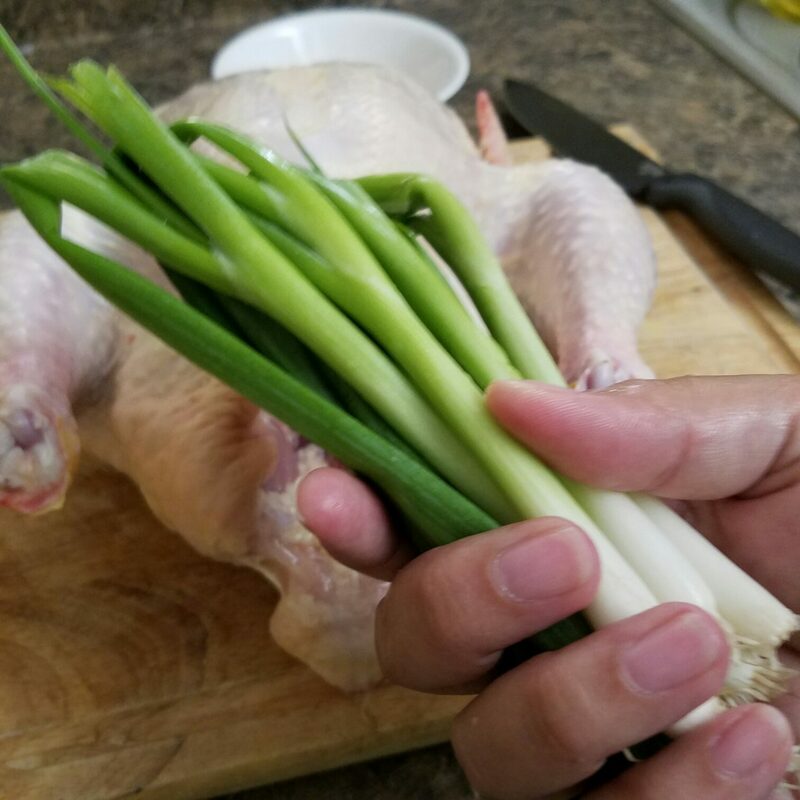 Prepare chicken feet by cleaning well in cold water and clipping off the claws. In a large pot, add 2 can coconut milk and 2 can water (just measure water using the coconut milk can). Add a teaspoon of palm sugar and a splash of fish sauce. Add chicken feet and the rest of the chicken meat to simmer for about 2 hours or until all meat is cooked through and tender. If you haven’t prepared your vegetables yet, this is a good time to wash and cut them. Spoon two to three tablespoons of coconut milk mixture from cooking the chicken pieces into a very large pot or super-sized wok over medium-high heat. Add the 4 to 6 tablespoons of green curry paste (less if you prefer curry less spicy). Use a wooden spoon to stir the curry paste into the small amount of coconut milk until smooth and bubbly and continue to cook until curry paste changes color and becomes very pungent, about 3 to 5 minutes. Add cooked chicken feet and chicken meat. Stir to ensure that all chicken pieces are separate and coated in curry paste. Add the coconut milk mixture to cover. Stir gently and bring to a simmer. Lower to low heat and add Thai eggplant quarters, winter melon, kaffir lime leaves, and basil leaves. Allow to simmer for 1/2 hour to an hour. Add fish sauce in teaspoon increments, stirring thoroughly and tasting each time until the curry is salted to taste. Add palm sugar a teaspoon at a time to taste also. (Sugar should be used sparingly here, only to deepen flavor and not to make the curry actually sweet. The winter melon and eggplant already have a natural sweetness.) Add Thai peppers a few slices at a time depending on how much more spicy heat you want to add to the curry. Allow to simmer covered for a total of 2 hours so that chicken is very tender. The longer this cooks, the better the flavors develop so don’t worry about allowing to simmer longer covered. This is a low to medium spicy curry for me. If you don’t prefer spicy curry, you can reduce the amount of curry paste and opt out of adding the peppers to the curry during cooking. Just before serving, slice Thai red peppers in half and clean out seeds (this is where the majority of the hot flavor is). Slice the red halves in thin slivers and sprinkle across the top as garnish. Winter melon is also known as Christmas melon, wax gourd, or ash gourd. It might be difficult to acquire. Chayote is a reasonable substitute or even zucchini. 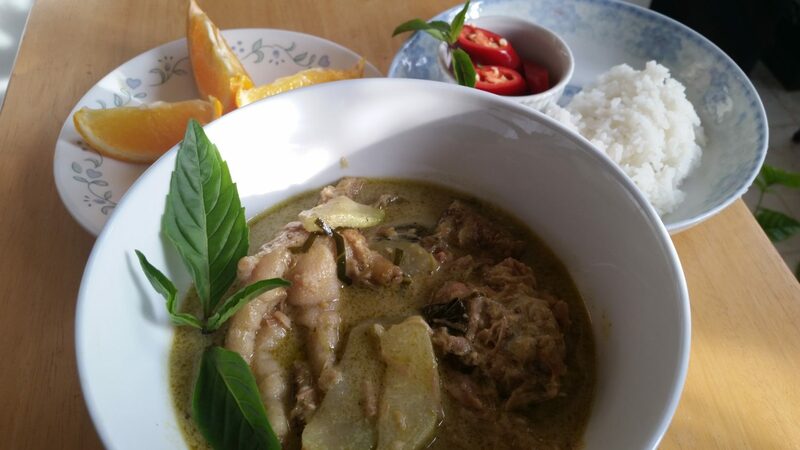 Serve with Thai white rice. 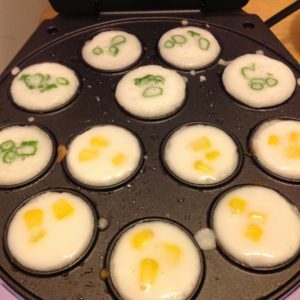 Kanom Krok (ขนมครก) is a Thai street food I enjoyed growing up. It was generally available in the market place around breakfast time but can be enjoyed throughout the day. These little cups have a thin, crispy outer layer with a super soft delicately coconut inner core. Some may add a few kernels of sweet corn or a few shreds of spring onion for added flavor but I find these are just as good on their own. Make the inner layer by combining all of the ingredients in a small bowl and mixing until smooth. Set aside. Next start to make the outer layer by mixing all ingredients except the cooked jasmine rice, coconut flakes, and 2 tablespoons of the club soda in a small bowl. Set aside. Pound or blend the cooked jasmine rice and coconut flakes with the 2 tablespoons of club soda until they form a fine paste. I use a traditional mortar and pestle made in Thailand but a food processor will do the job. Incorporate the rice and coconut paste into the rest of the outer ingredients along with the remaining club soda. Add a drop of canola oil (~1/8 teaspoon) to each well and let it get hot. It should be hot enough that when you add the batter it sizzles. I used a silicon pastry brush to oil the little wells. Add about 1 tablespoon of the outer layer mix to each well and then lift the pan (using a pan holder – it’s hot!) and swirl it until the batter forms a thin layer around the entire well OR use a tiny spoon or chopsticks to gentle press the batter up along the sides of the well. I used cooking chopsticks and found this safer than lifting the pan and swirling. Add about 1 tablespoon of the inner layer to each well to fill it. If you want to add toppings, add them at this point. Then, cover the pan with a top and let it steam for about 5-6 minutes until the bottom layer is golden brown and the top layer is fairly solid. Using a teaspoon, gently lift each custard from the pan. They should be golden brown on the undersides. 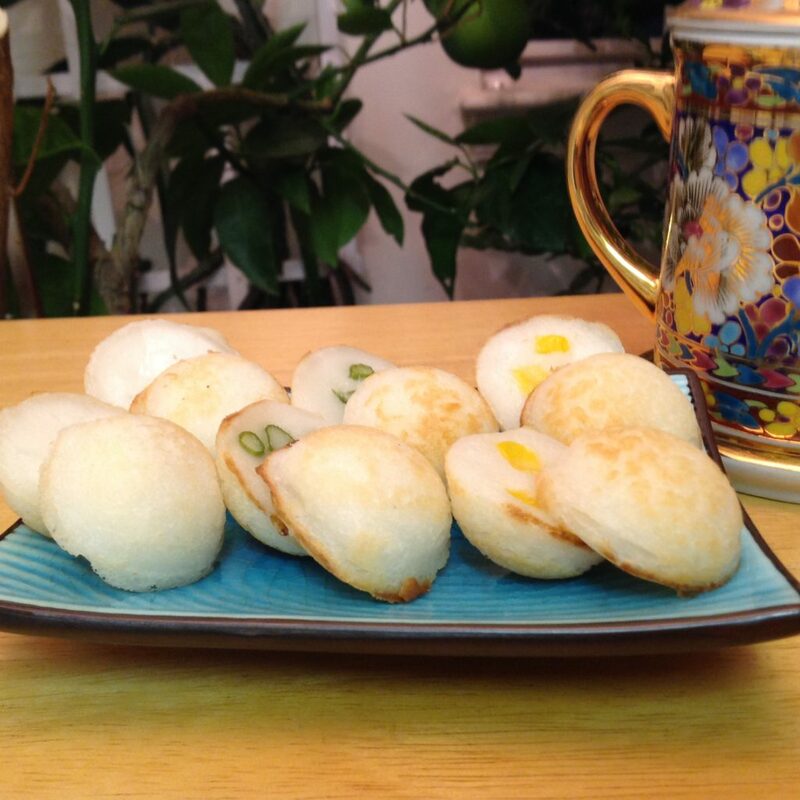 Serve the kanom krok in pairs of two.